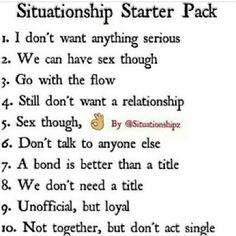 More and more people are getting themselves into SITUATIONSHIPS, calling it RELATIONSHIP. A generation that falls in and out of what they call Love, dating and sleeping with about three(3) or four(4) different people in a single year making themselves more UNSTABLE for the ATMOSPHERE OF MARRIAGE, and then amazed that their marriages are not working. Let’s deal with these SITUATIONS that make having lasting RELATIONSHIPS difficult.